You have come to the right place for life casting and general casting materials for reproducing your art work and other models. EnvironMolds offers a wide variety of casting materials for almost any application such as sculpture reproduction, taxidermy, cold casting, museum work, ceramics, paleontology, archeology, prototyping and modeling. Silicon moulds and polyurethane resin casting supplies are exciting materials because of the sheer creative potential they hold. Our 2-Part plastic resin casting compounds are perfect for creating and replicating projects. For inexpensive reproductions using our casting material, nothing beats CastRite Art Stone for high quality, high detail reproductions. Its bright white finish resists moisture and is ideal for painting. For mask making and props, you can’t beat our RD-407 Casting Latex. It is used with a CastRite molds to provide long-lasting, flexible rubber reproductions. Our RD-407 is also a high quality dipping latex used for a wide variety of purpose including covering and insulating tool handles and waterproof coatings. One of EnvironMolds specialties is it wide selection of 325-mesh (fine) cold casting materials. When mixed with AquaClear or KastEZ or other polyurethane resins, you can achieve the look and feel of metal, wood or stone metal. Choose from bronze, brass, tin, marble, limestone, porcelain or wood powders to create unique casting finishes that will make your art stand out. Chose from our family of low odor, polyurethane casting resin. 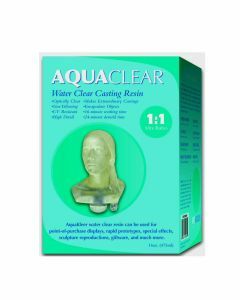 We offer AquaClear which is a water clear resin, KastEZ and Por-A-Cast resins which are an ivory-white opaque resin the sat in about 10-mintes. All our resins conveniently mix at a one-to-one ratio so you don’t need a scale to weigh them out, just match the levels in the two containers and mix. It is that easy. These resins are also the ideal bonding agent to mix with our clod casting powders. If you are looking for a realistic rubber skin casting materials for animatronics or “reborning” doll reproduction, nothing can beat SkinRite 10 our translucent silicone. You can easily color or paint it with our line of Cirius Silicone Paint/Dyes. SkinRite10 is a ten to one mix ratio so you will need a gram scale to make certain of an accurate measure before combing the base with the catalyst. You can also find casting fibers and fillers here for strengthening your castings or extending them for a more cost effective finished art piece. One of our newer casting materials is Clear Ballistics Gel. It is used in ballistics testing and cast into molds by applying heat to melt it and then poured in a mold. But it can also be used to cast other objects as well. The advantage of these thermoset compounds is that they can be used over and over again by just remelting. We didn't forget presentation either, as we offer a number of mounting options for your artwork including marble and wood bases and engraved names plates for the perfect gallery touch to your finished castings materials. Be certain to check out all of our great casting materials. We are continuing add items items so be sure check back with us from time to time. If you don’t see a product, please ask us and we will be certain to sock it for you.